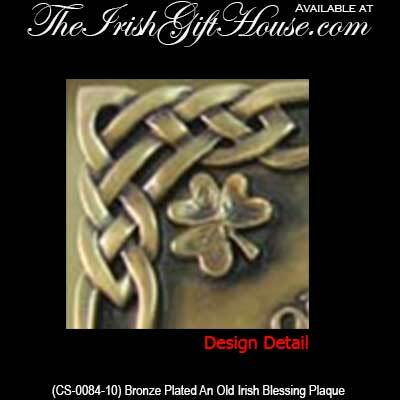 Irish blessing plaque is a bronze plated design that features Celtic knot-work along with shamrocks. This Irish blessing wall hanging features a Celtic knot-work motif along with shamrocks. 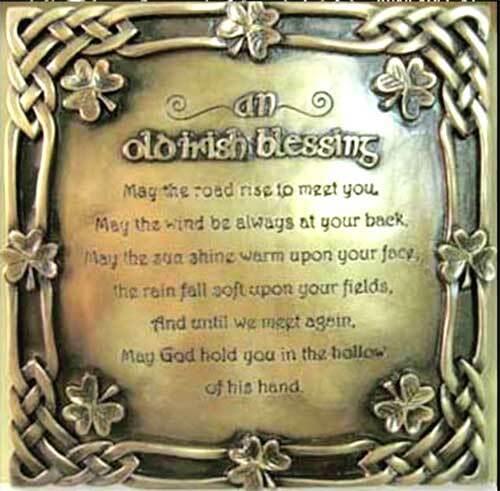 Made of hand crafted, cold cast bronze plated construction this traditional Irish blessing plaque measures 6" wide x 6" high x 1/2" deep and has a dimensional design that is ready to hang on your wall. This Irish blessing plaque is made in Ireland by Celtic Shadows and it is gift boxed with shamrock and Celtic knot history cards, complements of The Irish Gift House. 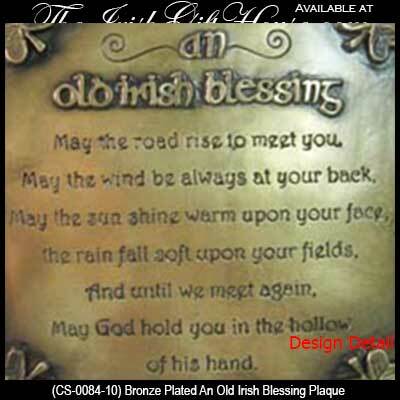 This Irish blessing plaque from the bronze Gallery features gifts with intricate Celtic modeling. Inspired by the artistry of early Celtic craftsmen, motifs of interlacing knot work, animals or human figures are in keeping with this traditional Celtic style. Each hand crafted cold cast sculpture is plated in bronze and carefully polished to highlight the elaborate detailing.